Preheat the oven to 425°F. Line a baking sheet with foil and lightly coat with cooking spray. Heat cream cheese in the microwave for about 30 seconds so it's soft and easy to stir. Add green salsa, lime juice, cumin, chili powder, onion powder and garlic powder and mix well. Add cilantro, green onions, chicken and pepperjack cheese and combine well. Dip in El Paso™ salsa, sour cream, and guacamole. Turn into a delicious meal by serving with black beans and rice. In high school, my friends and I used to frequently cruise on over to our local 24-hour hole-in-the-wall Mexican joint to order taquitos at odd hours of the night. The taquitos were chewy, greasy, and filled with some kind of mystery meat. As we ate them it was inevitable that we would end up with grease rolling down our chins and puddled at the bottom of our plates. Yuck! Not good for my figure or my complexion. Now that my taste buds are more refined and…ahem…more selective, I’ve searched for a healthier alternative for my beloved taquitos. Usually when I try the healthier version of my comfort foods it’s just never quite the same flavor or texture that I’m looking for. 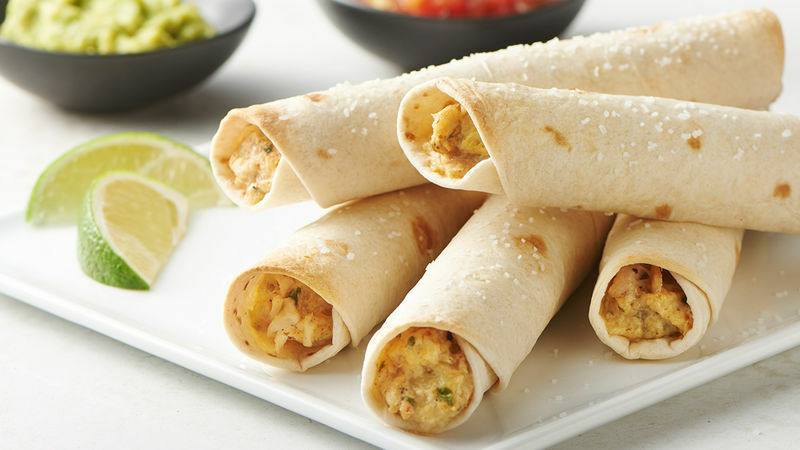 But honestly, these Baked Creamy Chicken Taquitos are not only healthier and less messy than the traditional fried version but they still have that crispy crunch when you bite into them. Taquitos are a great way to use up leftover chicken that you have in your refrigerator. I’ve also made these with leftover shredded beef or pork too and they’re equally as tasty. The only tricky part can be rolling them. These taquitos use flour tortillas because unless they’re fried, corn tortillas will end up cracking when you roll them. Just make sure to place a couple tablespoons of filling onto the bottom third of the tortilla and roll as tight as possible. These can be served as an appetizer or made into a quick and easy meal by adding some black beans and rice. These family friendly taquitos will have your family dipping and crunching in no time! Time Saving Tip: Work all day? Need a quick dinner? You can make the filling ahead of time and store it in the refrigerator. You can even freeze these taquitos to have on hand for those busy weeknight meals.